Ringworm pictures | causes & symptoms, how does it look like? 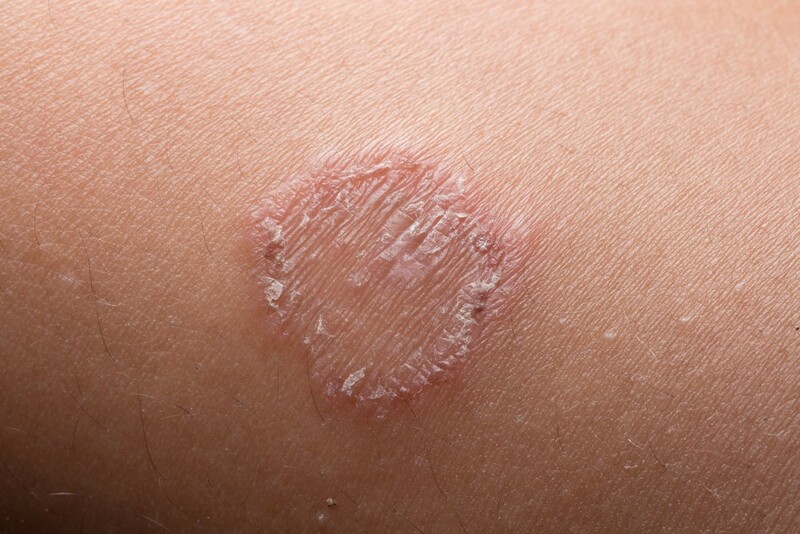 What is the first thing that comes to your mind when you hear the word ringworm? Does it resemble worms moving in a circle slithering around your skin? 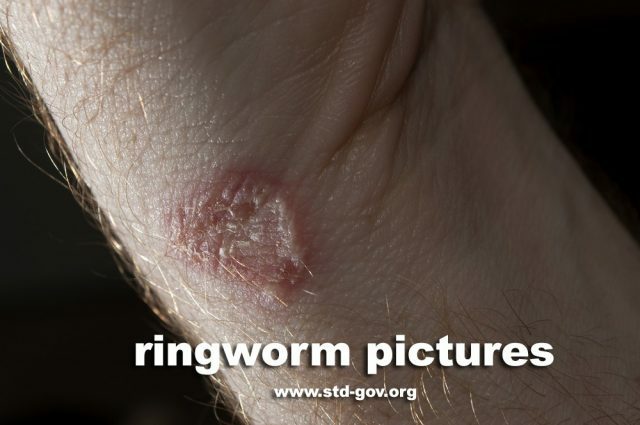 If yes, then let us tell you that ringworm is far less creepy than the name suggests. Don’t go by its name as it is not caused by worms! It’s something which is caused by group of fungi called dermatophytes. 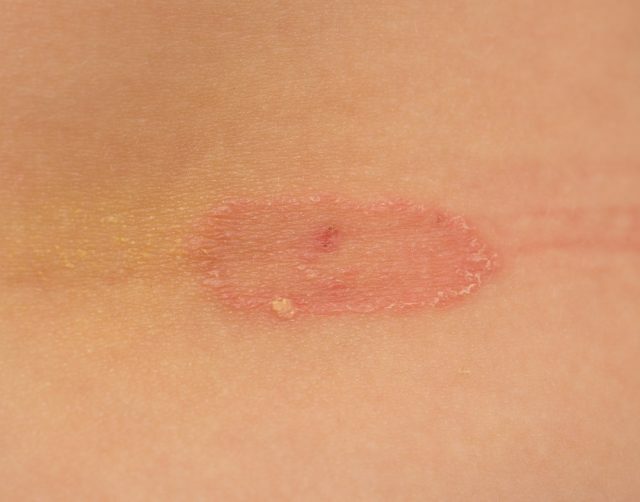 If you check out some of the pictures of ringworm then you would be able to relate that it has got its name from the distinctive ring-like pattern which the red spots form on the skin. It is highly contagious infection and can occur in your pet dogs, other animals and in humans too! In dogs or other animals it occurs because of transmission of fungus from infected animals or through beddings, dishes and other materials in environment. Since this is highly contagious, it can spread quickly in kennels, shelters and other places where bunch of dogs stay. 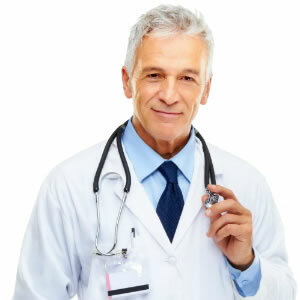 This infection can also spread in humans through infected person, animals, object or even soil. Fungi are present everywhere in the environment. But heat and moisture help fungi grow and thrive and thus locker rooms and swimming pool has highest content of them. You can get it by sharing contaminated towels, clothing or equipments of infected person or through your pets. Touching the infected pets, grooming their items, saddles, carpeting and their bedding can spread ringworm in humans too! Also, it is believed that it can only spread in children but it can happen to anyone! So don’t go by ringworm pictures children as it can spread in adults too! 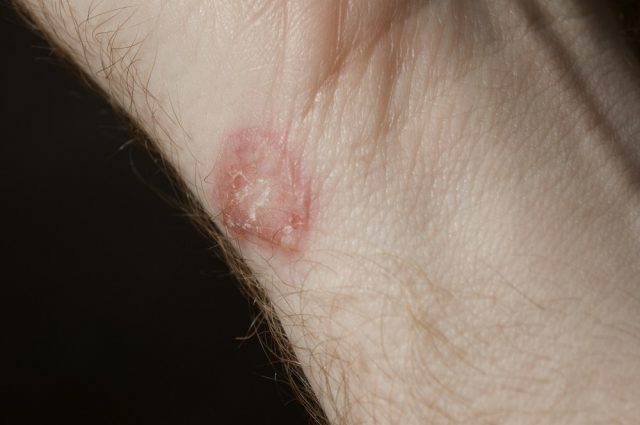 If you look at dog ringworm pictures then you would notice that it can happen anywhere. 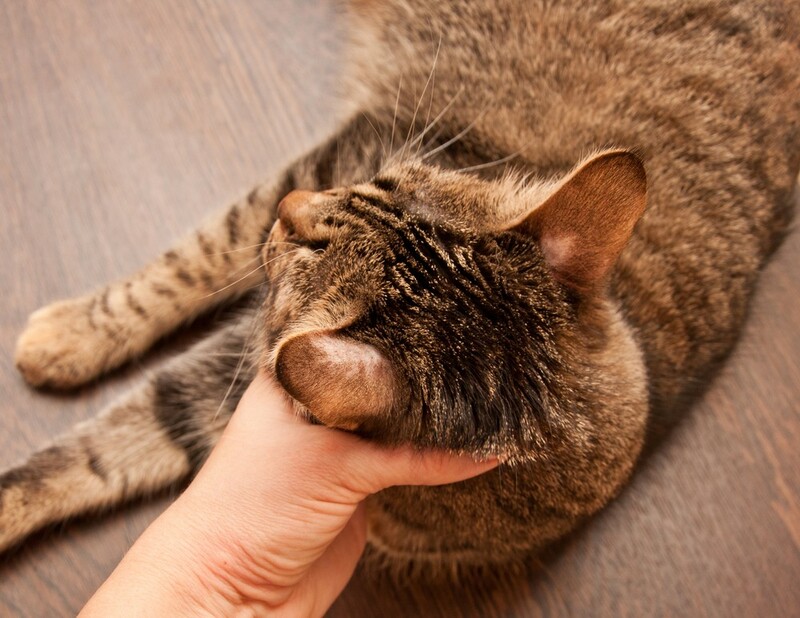 It can occur on dog’s head, paws, ears and forelimbs. 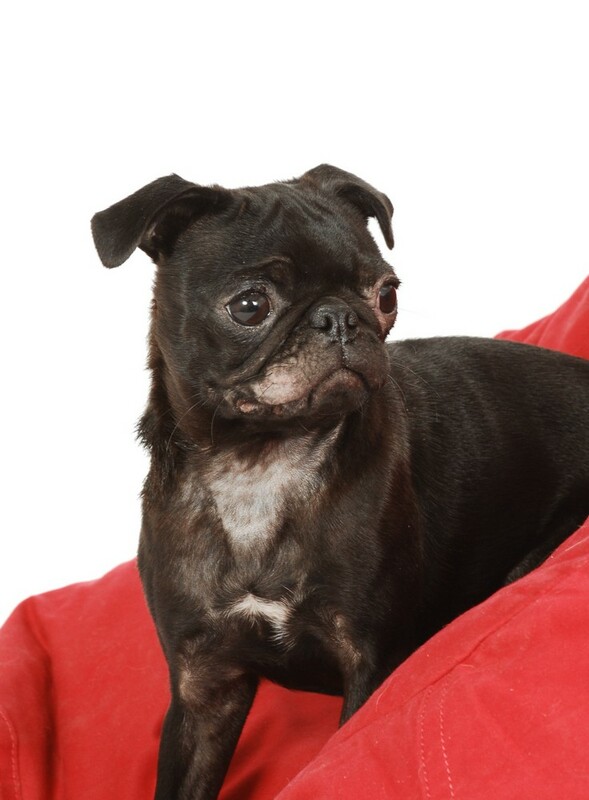 The ringworm in dogs pictures look like patchy, circular bald steps that appear red in centre. Gradually it spreads to entire body causing shedding of hairs. Scalp: appears as patchy, scaling bald spots on the scalp if you have seen ringworm on scalp pictures. Foot: cause scaling and inflammation in toe webs, also known as Athlete’s foot. Beard: Similar to scalp ringworm pictures, beard ringworm also eats up hairs in that area and has a bald sort of spot on your beard due to fungus. Face: It can also occur on areas outside the beard i.e., on forehead, eyes and area surrounding nose. 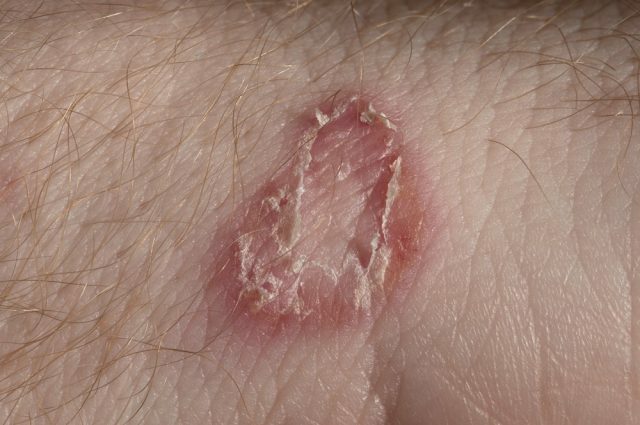 The ringworm looks like a circular rash with wavy or curvy outside edges. The border of the rashes is darker in shade than the rest of the skin if you look closely at ringworm rash pictures. This infection can last for about 2-3 weeks depending upon the immune function, diet, medication a person/animal suffering from it is consuming. The ringworm healing stages pictures clearly reflects that it becomes extremely red and itchy while it is healing. During this healing stage you should apply antifungal cream, Aloe Vera tincture or apple cider vinegar to counter the itchiness.